I was thinking about this for quite some time now — an actual retweet button for WordPress, and I wonder why Twitter hasn’t provided one yet, it’s so obvious! They show your name and your Twitter avatar along with the original message, so when others see your tweet retweeted, there’s a better chance they’ll follow you. They instantly show up in your Interactions and increase the retweet count, so you can always see who’s tweeting your posts, without having to use Twitter’s search. They give you a better chance to get a Top Tweet, thus providing even more exposure. 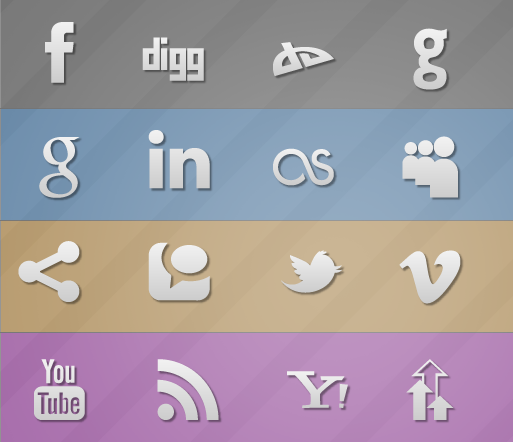 I hope you all got the first part of this icon set, but even if you didn’t don’t worry, this is just an extension to that set that includes Technorati, Yahoo, Github, MySpace, Vimeo and others. And just like the first set, released under the GNU General Public License v2 — use this for any personal and commercial projects. No attribution required (although appreciated), feel free to share, modify and build upon. Download the PSD file and of course retweet this post! Here’s a freebie for you social media lovers — a brand new social media icon set, designed for dark and colorful backgrounds. Feel free to use this on your website or blog. This is one of my first icon sets, so I’d appreciate some comments and feedback. I decided to release this under the GNU General Public License v2 so feel free to use this for any personal and commercial projects. No attribution required (although appreciated), feel free to share, modify and build upon. Now with the Facebook Like Button! 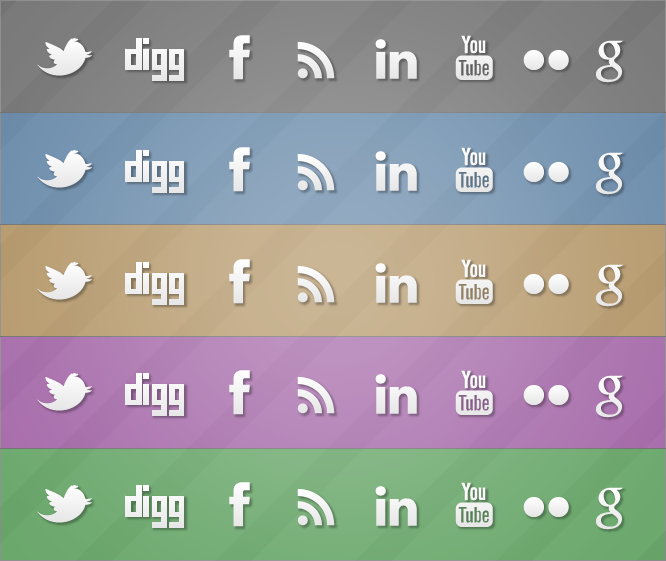 Obviously, the Facebook Like button is one you’d like to implement inside your blog, website or whatsoever. I did too, although I am quite late as everyone has theirs for ages, but why not share some thoughts about it and the whole social widgets riot? As we all know (or maybe suspect) the web is going social, and what value is your blog if your readers can’t share your article with their friends with a single click of a button? Right. Who needs those extra WordPress plugins when you can simply copy and paste a few lines of code into your sources? As long as you have a little bit of general HTML knowledge you’ll be fine. If you’re a developer though, you’ll find all these extras much more interesting than an average person. I’ll keep this post closer to what Facebook has to offer, but the thoughts are fair for others too. If you’re into the Facebook Platform, then you must have had some experience with FBML, iframe coding for Facebook and Facebook Connect. After Facebook rolled out their official PHP library, things began to make more sense, as you don’t have to spend too much time reading the specs to their API, everything’s done for you and wrapped into a set of classes, well documented and ready for use. Amazing! Anyways, the bottom line is that Facebook (and everyone else) are doing quite good at providing tools to fulfill your website with the social juice available. Oh, and don’t forget to “Like” this post, and of course retweet. Cheers! What we’ve seen so far at Twitter @Anywhere is amazing! I’ve seen tonnes of websites implement Twitter functionality to ther websites without any hassle and it also seems to work well! Now that the documentation is being arranged, everything seems clear enough, this is yet another way of branded tweeting! Branded tweeting? Huh? Well, this is a topic covered quite sime time ago, when companies (and individuals) wrote specific Twitter clients via the available OAuth libraries, that would send out tweets marked “via application”, where “application” could be the name of the company, linking to their website. Such applications were standalone (Visual Basic, C#, etc) or web-based (perl, php), and some of them were not only meant to tweet, but sometimes looked like a full-feature Twitter client. But, the time has changed. In order to brand the tweets, all you have to do now is register your application to use OAuth at dev.twitter.com and copy-paste an @anywhere snippet called tweetbox, somewhere on your website. It could also be a private area (or even a local html page), doesn’t matter. The engineers at Twitter have worked out all the OAuth routine for you, and what you’re left with is an awesome tweet box, just like on twitter.com, through which tweets will be sent out “branded”, i.e. containing your application name in the “via …” clause. This is certainly easier than how we had to do it earlier, and I’m expecting a huge impact on the Twitter clients list, which will increase dramatically, as more and more companies and individuals would like to see their names in the client section of every tweet. Of course this move is quite serious, as it may destroy some of the statistics that Twitter gather, where “web” used to take the lead. P.S. You can now chirp me, which took me a few minutes to build with Twitter @Anywhere. As mentioned on TechCrunch, Evan Willams at Chirp confirmed that Twitter will sooner or later launch its own URL shortener, probably called twee.tt or twt.tl (both owned by Twitter). Well, let’s just hope that they do a good job at this. I’m talking about the future functionality and the links riot going on for quite a while. It seems that more and more people and businesses are branding their Twitter accounts by using their own shortening services – fb.me by Facebook, goo.gl by Google, etc. We all hope that short URLs posted to Twitter will not be re-shortened using Twitter’s new service. This sometimes happens with the current shortening capabilities of Twitter, short links are sometimes re-shortened using bit.ly, causing a double redirect, which is awkward. Statistics and analytics is another good part of bit.ly. Hope they don’t miss that too, which might also be a chance to get some extra cash in, offering businesses detailed analytics. But one issue still persists, on each and every URL shortener – rev canonical and shortlink HTTP headers. Maybe such functionality may be in advanced settings for each Twitter account, but I’d really love if Twitter used my own short URLs when I post stuff from my blog instead of bit.ly or their future ones. I got my own analytics set up and I’m pretty sure everybody does, so why not give us a chance to brand ourselves a tiny bit? Well, if that doesn’t work out then I’ll have to continue writing my own desktop/mobile Twitter client, or keep sending tickets to TweetDeck and Seesmic. How can we talk about HTML5 if things aren’t yet sorted out with rel and rev canonical. And what about IE6? Heh ;) Don’t mind me, I’m just thinking out loud.. Cheers!